These Hologram shorts I won at an eBay auction in 2005. 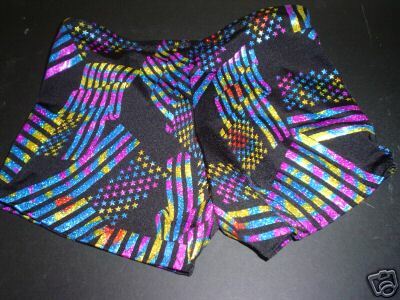 Seller was ebabee6464, and it was given this description at the auction: Mens Hot Shorts. Molds to you and leaves the indelible imprint of being one of a kind! Black Swimwear lycra with rainbow holograms. My fabrics are selected carefully for quality, each one must pass the test of passing through my own hands. Most of you who understand fabrics know that the best items begin with the nicest fabrics. Truthfully, I value you too much to sew mediocre fabrics.